I’ve Been Nominated for an Illuminating Blogger Award! | Portraits of M.E. 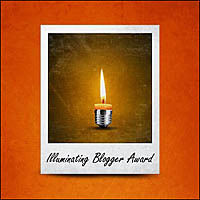 I’ve Been Nominated for an Illuminating Blogger Award! Part of being recognized is for me to share a random thing about myself…hmmm, well…geez thinking of a random thought is kind of hard. The only thing that comes to mind is that I love coffee! It’s actually a motivator for me. When I have to do something that isn’t really fun for me, I go to Starbucks or another local coffee shop first. After buying a yummy hot (or cold) latte that chore becomes a “fun” event for me! It’s true – coffee is a good thing! Cynce’s Place – I’m a frequent visitor to this site because Cynthia always has great information to share when it comes to homeschooling. Plus, her posts are very interesting to read and I enjoy my time reading about her home. Training 6 Hearts 4 Him – When Linda takes a day off (which is rare) from blogging about her day, I swear I get withdrawals! She has a great gift to share her everyday life in an exciting and fun way that brings me back to her blog day after day. One Day at a Time – Casey’s blog has a warm feel to it and whenever I visit, I feel like I’m visiting a friend (which I am)! 😀 Her love for photography and the photos she shares are inspiring! My Life. One Story at a Time. – Donna’s blog is so full of information; from book reviews, to information about an author. Whenever I visit her site I am motivated to read and write. A great place to find that next wonderful novel or learn more about a favorite author. Bookhounds – Bookhounds is another great blog for those who love to read. Mary has reviewed many books and has done a wonderful job sharing her thought’s about each book she has read. I come here often to read her reviews. Every blog here has made a difference to me, in different ways, and I’m glad I’m able to share with them this award! Wow, Congratulations MaryEllen. I enjoy visiting your blog too and reading your reviews.